Since the beginning of the year Mollificio Valli srl has started a series of investments oriented to the 4.0 industry. The first one is the new Kamatech G45 T spring grinding machine for the grinding department. 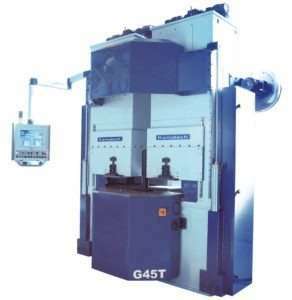 Kamatech G45 T has been conceived to use two grinding wheels with different mixtures, the rough grinding one and the finishing one and, adopting a dedicated disc with removable cylinders, it grants a quality increase of the processed pieces. This grinding machine, dedicated to bigger productions, is also able to block springs over the normal grinding. To exploit totally the potential and to increase the output in the next future a robot for the spring loading will be coupled with the machine: the whole machine working process will be therefore automatized.